Enter if you dare…3D Virtual Tour Halloween Special! This Halloween White Crow Studios teamed up with Housebuilder Cameron Homes to create a Halloween 3D Virtual Tour. The showhome presented by Cameron Homes become the perfect venue for us to stage our Halloween promotion. 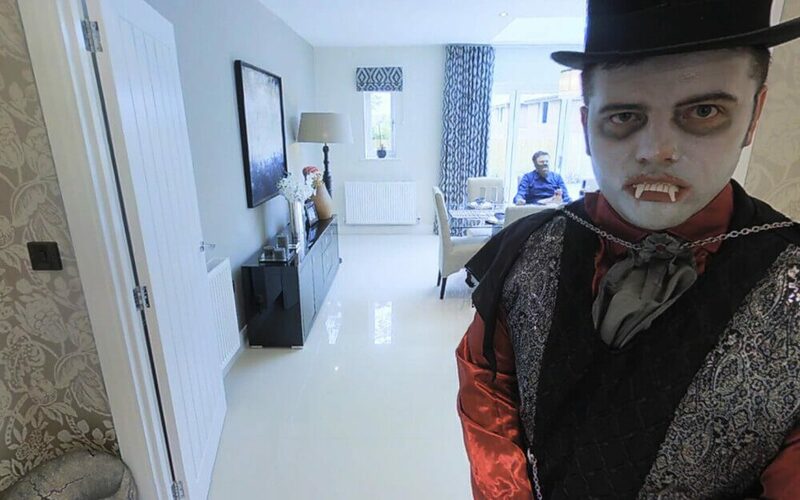 You are firstly greeted by Dracula who encourages you into the dining room to share a glass of Chianti with Hannibal Lecter, before your encounter with the Witches, but did you spot Jason? In the lounge you can sit with White Crows’ mascot Gerald the Gorilla before moving upstairs to pay for Little Red Riding Hood to pay a visit to the big bad Wolf. With Teenwolf in the bedroom and Bride of Frankenstein in the Master there are plenty of things to keep you entertained, but please remember to stay away from the balloons! 3D Virtual Tours are a perfect way to explore any built environment, allowing the user to explore the space in 3D before visiting the real thing! If you have a space you’d like to explore call us to book a demo on 01543 258357.